Speaking of local traditions, Sinterklaas is approaching again, and with it, the controversy over Zwarte Piet (Black Pete). As I posted last year, Sinterklaas (the holiday) takes place on December 5th. On that day, as well as the weeks leading up to it, Sinterklaas (the person) delivers gifts to children, landing on their roofs on his horse and delivering the gifts through their chimneys. He’s not the one doing the actual down-the-chimneying, though. His helpers do that: Black Petes. Since about 1850, Black Petes have been represented by white people dressed in blackface, with curly black wigs, gold hoop earrings, bright red lips and “Moorish” clothing. Originally, they were severe characters, slaves to Sinterklaas. They carried switches for whipping bad children and threatened to carry them back with them to Spain. Nowadays that’s been toned down, and they play a clownish role. They’re also not slaves anymore, but rather servants. A few weeks before December 5th each year, Sinterklaas and his Petes arrive in the Netherlands on their boat from Spain. Their arrival and procession is always televised. Over the weeks until December 5th, Sinterklaas and his Petes will visit schools and shopping centers and so on, and, nationwide, enormous effort is put into keeping it all real for the children. There’s even a Sinterklaas news show, updating children on how and what the Petes are doing in their preparations for December 5th. 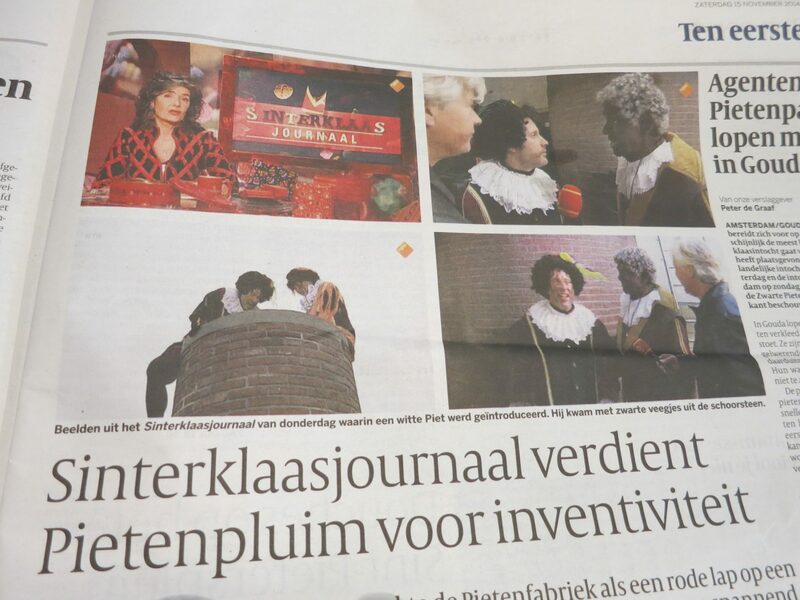 An article in the newspaper about the Sinterklaas news program on TV. This year for the first time a White Pete and a Sooty Pete were included. Nevertheless, giving in ever-so-slightly to pressure from the rest of the world, Zwarte Piet is slowly changing, particularly in the west of the Netherlands, where there is a far bigger minority population. In Amsterdam, the Petes this year accompanying Sinterklaas on his arrival weren’t black. Instead, they were “sooty.” This refers to one of the standard explanations for why Black Piet is black: “He’s sooty from coming down the chimney!” (No explanation is ever given for why his hair has gone curly and his clothes are still clean.) So instead of being painted completely black, they had smears of black on their faces. In Gouda, there was a white Pete and also a clown Pete for Sinterklaas’ arrival the other day, but the vast majority of the Petes were still black. There were protests, and dozens of the protesters (mostly black) were arrested. The general attitude is that it’s okay to protest, but not if it’s going to spoil Sinterklaas’ arrival for the children who’ve come out to see it. The concern, in particular, is that the children must not find out that Sinterklaas and Black Pete are not real. Here in Groningen all of the Petes accompanying Sinterklaas were in the traditional blackface. I’m very disappointed. In my view, a small provincial city like Groningen, where there are relatively few people of color so there is little built-up anger about the issue, could set the tone of change. Petes in all sorts of colors – green, purple, orange, polka-dotted, whatever – could have been introduced with little fanfare or fuss. We could have set an example for the rest of the country. It amazes me how tenaciously the Dutch people are hanging on to this tradition. They seem to think Sinterklaas as a holiday would cease to exist without Zwarte Piet. If they had any understanding of children, they’d see how easily this could be solved. The children would be just as happy seeing Red Petes and Green Petes and Purple Petes and whatever other sorts we can think of. Children accept what they are told and what they see. If they see Petes in an array of colors, then to them, Petes come in an array of colors. What’s important to them, anyway, is what the Petes do: bring gifts, throw candy, and generally entertain. Why is everyone making this so much more complicated than it is? Corrections November 17, 2014: The video I posted yesterday was from last year. The one you see now is this year, and as you can see, there are some slightly lighter-colored Petes on Sinterklaas’ boat. It’s hard to see from the video, but I think they’re Sooty Petes. The point still stands, as far as I’m concerned. Drop the Black Petes and go for multi-colored! Also, there were lots of Black Petes in Amsterdam along with the Sooty Petes, and I’ve heard mention of a stroopwafel Pete (A stroopwafel is a kind of cookie that is pressed like a waffle.). I’m not sure what a stroopwafel Pete would look like!